Pay-it-forward chains, where customers pay for the order of the person in line behind them, have become a thing at Starbucks drive-thrus — especially around the holidays. It's always a sweet surprise that usually sticks with participants throughout the day. 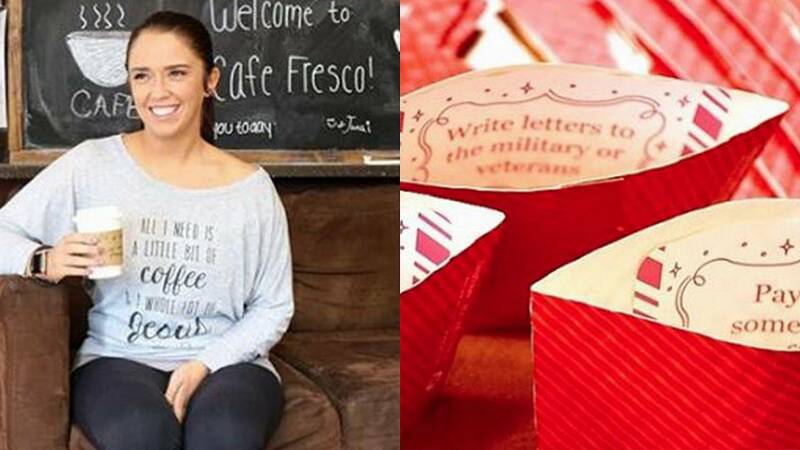 But the owner of a small coffee shop in Crown Point, Indiana, has come up with her own way to spread some love and is making a positive impact in the lives of her customers and the local community every day. Breanne Zolfo opened Cafe Fresco six years ago. When the shop wasn't super busy, she and her employees would jot down inspirational quotes on random coffee cup sleeves. Pretty soon, customers started requesting the quotes if their sleeve didn't have one. "Believe there is good in the world." "There are people who go through their whole day, who don't have anything positive or inspirational in their day," Zolfo told TODAY Food. "To be a small part of that is really cool." But Zolfo's mission isn't just about sharing motivational quotes. Soon after she started writing on cup sleeves, Zolfo began encouraging her customers to go out and perform real acts of kindness themselves by writing a suggested good deed inside the coffee sleeves, like donating clothes to a homeless shelter or putting money in a Salvation Army jar. When they return with a photo or video of the deed, they get a free coffee. "The customers love it," said Zolfo. "They feel like they're doing their small part, too. They see the outcome. They see they can change people's lives." Mother Teresa, now St. Teresa of Calcutta, often encouraged her benefactors to do the same: to not just donate money, but to actually come see how their money was being used, which she felt would change the donor in the most impactful way. And every week, Zolfo takes all of the money collected in the tip jar (they call it the "Community Love Tip Jar") and surprises someone local with something special. After asking a homeless man what he really needed, the Cafe Fresco staff surprised him with a bike. He returned to the shop a few years later and explained how the bike totally transformed his life by enabling him to have transportation to get a job. He is now no longer homeless. She also surprises people in grocery store checkout lines by paying for their bill. "We planted a small seed in Crown Point, Indiana, and now people are spreading our mission to other cities and states. When we have other people helping us, that's when we can do it everywhere," said Zolfo. To continue her mission, Zolfo says she'd love to get a "Community Love Bus" and drive it around the country to surprise even more people with good deeds.